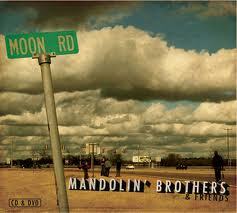 This six-track well produced and impressively packaged EP from the Mandolin Brothers benefits enormously from the input of several experienced Austin based musicians and creates a finished product that fairs well against some of the continental European offerings you come across. This Italian band have been sporadically active with their releases over the last decade but the ‘Moon Road’ EP recorded and launched in 2010 shows what they can be capable of with a little assistance. The six-piece band led by ‘’Jimmy’’ Ragazzon doesn’t appear to have any brotherly family links on the surface and a mandolin only appears on two of the tracks but you might as well have a memorable country name if you’re going to try and crack that market. As a band they produce a tight close knit sound that leaves you in little doubt what they’re trying to achieve and what direction they’re heading, with it definitely being more Texas than Turin. However you’re always going to be in fine hands by enlisting the assistance of Reckless Kelly’s Cody Braun. All six tracks are Mandolin Brothers’ originals with Ragazzon having a writing input on each one with perhaps the two stand out songs being the slower numbers ’49 Years’ and ‘Moon Road’ where the reflective song writing subjects match the tempo of the tunes. ’49 Years’ with its fiddle interludes ponders the advancing years of the character who seeks solace with their guitar while ‘Moon Road’ uses lap steel effectively in a song dedicated to a ‘lovely’ daughter. These two songs slot in as number’s two and three on the EP, sandwiched by two more upbeat tracks that have a country rock tinge to them. ‘Hold Me’ opens the album with a driving feel to it while ‘Old Rock and Roll’ has a sound that encompasses the title. The final two tracks, ‘Dr Dreams’ and ‘Another Kind, are where the mandolin appears with the latter being your archetype war protest song, a subject not always tackled in mainstream country music. While this collection of songs doesn’t warrant delving into the band’s back catalogue, the credibility given to the short recording by the Austin based musicians will certainly add some relevance and create further interest should the Mandolin Brothers develop this project with a full length release some time in the future.